The U.K.’s specialist lending sector plays an essential role in providing credit to the c. 20 - 25% of the U.K.’s adult population that is considered sub-prime and is poorly served by mainstream financial institutions. In our previous Executive Insights covering the sector’s development between 2009 and 2014 (Consumer Specialist Lending: Newly Sustainable or Another Boom-and-Bust? ), we discussed its revival in the aftermath of the financial crisis. Outstanding balances at the end of 2014 had started to approach pre-financial crisis levels, which naturally raised questions about the sector’s sustainability as it navigated through changes in regulatory supervision. We highlighted the essential ingredients for success for lenders operating in this new world. By early 2018, a significant majority of the sector had achieved full regulatory authorisation. Affordability assessment has become an important feature of operating in this sector and lenders that we work with have significantly enhanced their focus on both income and expenditure assessments to ensure that customers are able to repay. This tightening of processes and focus on responsible lending might have been expected to reduce the amount of credit from specialist lenders, but the actual progression of the market has defied this logic. Between 2014 and 2016, our analysis suggests that the overall outstanding balances of lenders actively operating in this market grew at c. 9% p.a., with balances in aggregate at the end of 2016 at an all-time high of c. £16 billion (see Figure 1). 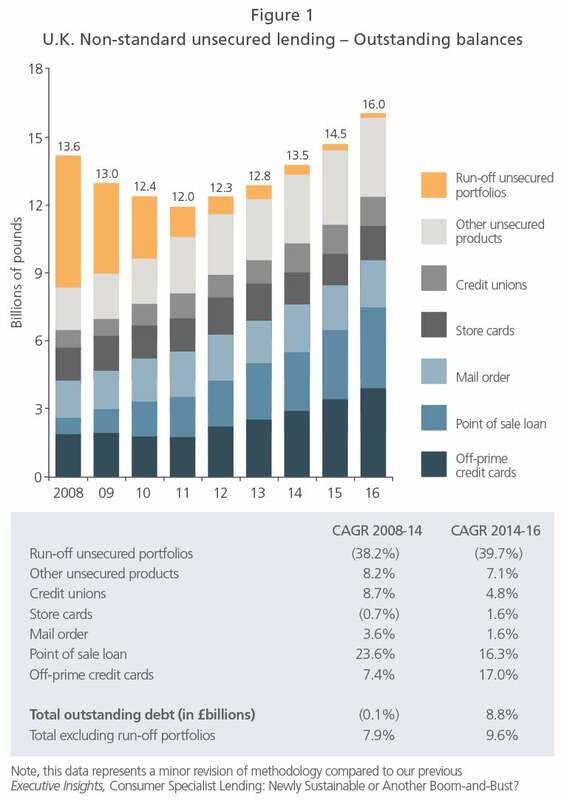 As Figure 1 shows, point of sale finance and credit cards have been the largest drivers of growth. This is in part linked to greater consumer confidence and spending over recent years, as well as expansion from the supply side driven by the greater availability of financing at retailers, the increasing maturity of lenders (including more rigorous underwriting, and better and broader use of data), and the availability of alternative funding, including securitisation. Store cards and credit unions, in contrast, experienced relatively modest growth, reflecting the greater maturity of these segments. There are more disparate trajectories at a product level within the ‘Other unsecured products’ category (see Figure 2). The increased regulatory scrutiny of and intervention in the ‘rent to own / buy’ sector has contributed to a significant decline in balances. In parallel, the ongoing migration of customer channels towards online has meant a re-evaluation of business strategy for this type of lending. This will continue to play out over 2018. Growth in the car finance segment has mirrored growth rates seen in prime car finance, reflecting greater consumer confidence and used car purchases, increased availability of finance from lenders and online brokers, and a gradual progression towards higher LTV lending. Following a period of steady decline to 2014, home collected credit has been relatively stable over the last two years, in part driven by the greater professionalisation of smaller players. However, we expect to see an overall decline in balances in 2017, reflecting the well-chronicled changes in the operating model of the industry leader. High Cost Short Term Credit (HCSTC) lenders have resumed growth after achieving full authorisation. As expected, the leading players are now offering a range of medium-term products (12-24 months) in addition to their short-term propositions, resulting in an uptick of balances between 2015 and 2016. We expect these to have grown further in 2017. 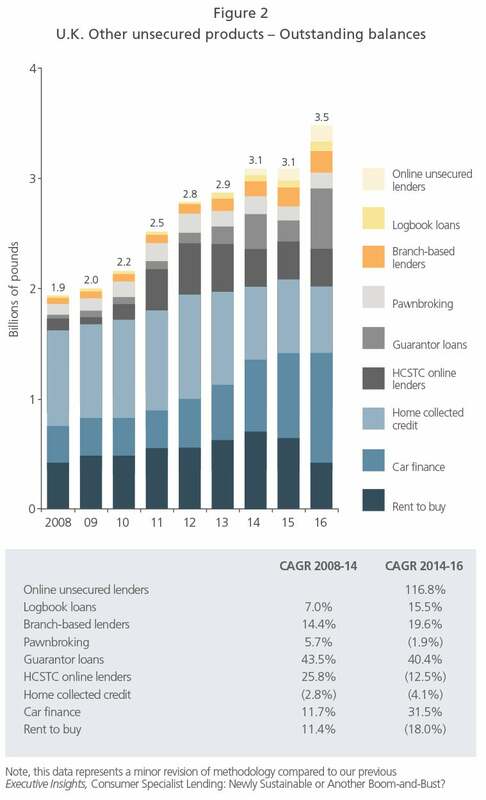 Guarantor lending is now emerging as a more mainstream product, with significant growth in balances in recent years. While the industry leader continues to grow originations and, with the lion’s share of the market, drive growth of the category overall, a couple of smaller players are also beginning to reach maturity. This period also witnessed the growth of longer-term unsecured loans at APRs in excess of 40%, completed both through branch and online / remote channels. Despite advances in scoring and risk assessment, the latter continues to be a challenging channel to operate in and we may very well see some changes to this landscape in the next twelve months. Standing back from the individual product level, there has also been some momentum towards multiple product offerings from some of the larger market participants. However, this has largely stopped short of any genuinely integrated offering that provides a holistic solution to customers’ borrowing needs. The industry is far more mature in its post-authorisation phase and credit is due to the regulator for having taken the industry through this process diligently. Consumers are, with few exceptions, being treated fairly, and affordability and forbearance are part and parcel of business as usual. Existing businesses continue to innovate around their propositions and products, and new entrants are operating under the stricter rules of the game. With some exceptions, in 2017 we expect the sector to have seen continued strong growth of balances. Looking at 2018, there continues to be considerable unmet demand. However, economic uncertainty remains the key unknown at an industry level. While consumer affordability assessment has certainly been made more robust and there are built-in buffers in most players’ income / expenditure assessments, there may be some adverse impacts to originations and default rates should a slowdown materialise. Beyond this, the potential for a more integrated “whole of customer” offering remains, and the impact of Open Banking / PSD2, may offer further opportunities for non-standard lenders to compete at the margins with prime lenders and banks in some product categories. But it’s early days in these areas, and we don’t expect 2018 to see market-altering progress. Deposits Strategy: An Inflection Point for Challenger Banks? Lower for Longer: Have Low Base Rates Permanently Changed Financial Services? There are very few trillion-pound markets in the U.K., but wealth management is one of them. Second Charge Lending Market: Born Again or History Repeating Itself?